Reaching higher than the Trump administration’s fiscal 2018 budget, the House Republican plan sets the goal of cutting unmerited payments in such programs as Medicare and the Earned Income Tax Credit by 50 percent within the next five years, rather than Trump’s 10. “It would also be required to develop a tighter system of agency oversight to ensure agencies comply with commission recommendations and achieve the reduction goal over time,” the resolution said. The current governmentwide estimate of improper payments stood at $144 billion for fiscal 2016, according to the Government Accountability Office, and the Republican plan aims to trim it by a cumulative $700 billion between now and 2023. That vision was music to the ears of several officials and industry specialists who attended a Thursday forum with the American Council for Technology-Industry Advisory Council. Many of them have been involved in agency struggles to vet outgoing payments using data analytics as required under three major laws targeting improper payments and more general waste and fraud. The commission idea is “intriguing” to Dave Mader, the longtime Internal Revenue Service alumnus who until recently was U.S. comptroller before becoming chief strategy officer for Deloitte Consulting. “The issue is really not partisan, so if you get the relevant parties around a table, you could share data on how to bring agencies to capacity,” he told Government Executive. A commission, Mader said, could help break some of the logjams in getting federal agencies as well as states to share data that can prevent wrongful payments in such programs as food stamps, unemployment insurance and block grants. Rep. Gerry Connolly, D-Va., whose keynote talk at the forum linked the need to curb improper payments to restoring faith in government, agreed that the House plan to halve the bad-payment rate “is not an impossible goal.” The number $700 billion “looks like a plug-in number, and we have a very unstable government right now with so many vacancies” in technology leadership jobs, he said to reporters after his speech. But progress will be made only “if Congress invests in the enterprise, to upgrade hiring skills,” which, he noted, are not a high priority in the Trump budget. 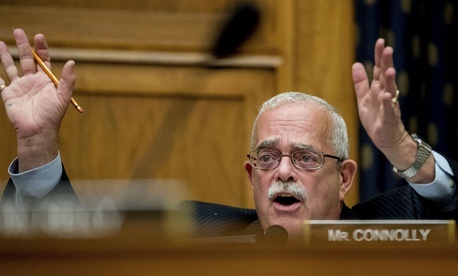 “I have yet to meet the citizen who sees nothing wrong with improper payments,” Connolly said. He contrasted poll numbers of faith in government during the Kennedy administration, in the 70th percentile, with the current figure, 17 percent. “Democracy is at risk when only 17 percent have faith,” he said, adding that the symbolism of the $144 billion estimate is more important than the actual amount. That figure amounts to $1.4 trillion over 10 years, he said, which is “roughly sequestration. If we could get it to zero, we wouldn’t have to cut anything or raise taxes." Investing more money in agencies is also a priority for Mader, who told Government Executive that Budget Director Mick Mulvaney had made a “compelling argument” that OMB deserves more funding in the fiscal 2018 budget. Of OMB’s 500 employees, “only three people are working on the $144 billion improper payments problem” at the same time they’re doing budget cutting and reorganization, he said. OMB, along with GAO, does “the best analytical work in town,” and they don’t have funds to hire consultants. A few more employees at OMB, Mader said, could be hired for just a few years.